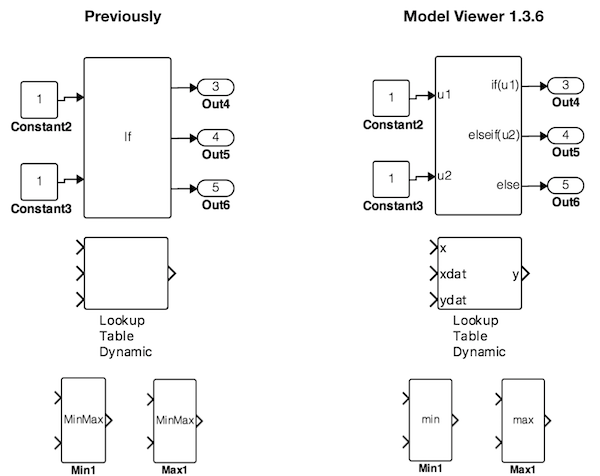 What is YAKINDU Model Viewer? Option to enable/disable hover preview introduced on the preference page. Filtering of parameters in the properties view improved. Properties view now displays additional information for special block types. During a log session, additional debug information is written to a log file. This feature can be enabled in the preferences. Broken reference blocks are displayed now with a specific visualization in the signal trace view. Unused menu items and toolbar icons are hidden now to provide a tidy user interface. If you have used an older Model Viewer version before, you have to reset the model viewer perspective once to clean up your user interface. You will get at corresponding hint at startup. Fixed a visualization problem for signal traces through bus creator and mux blocks. Fixed a bug which prohibited signal trace continuation for certain situations. Fixed a visualization problem in signal trace view when broken library references are involved. Fixed context menu action Open in new tab for stateflow models. 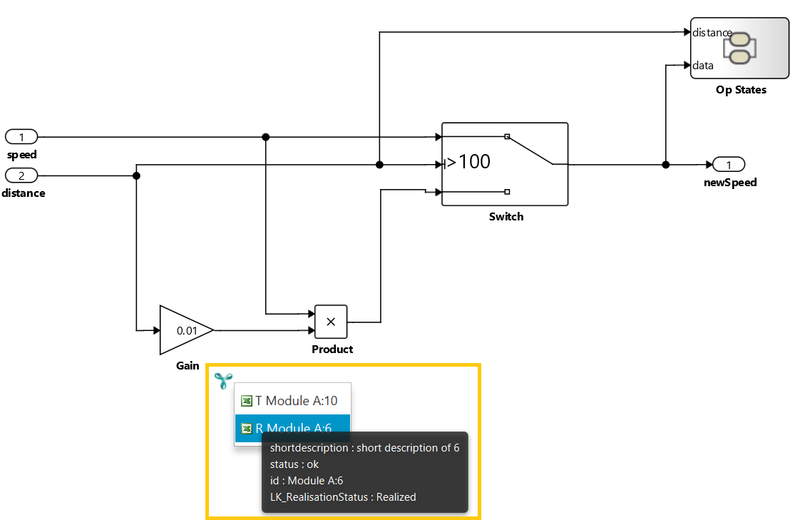 Context menu items Open in new tab, Open in Simulink, and Copy path to clipboard now also work on background canvas by taking the parent system as context. Back and forward buttons, as well as context menu entries, are now only enabled when these actions are possible. Outline tree now highlights systems that contain a traced signal. It is now possible to extend an existing signal trace to an arbitrary line in the model. New signal trace view allows for a better overview of the traced signal. C source code, XML, etc. Wrong position calculation of system preview fixed. Fixed path calculation of elements. It is now possible to extend a signal trace by double-clicking on a subsequent signal line or by clicking on Continue signal trace in the context menu. When hovering with the mouse over a system block, the underlying subsystem is shown in a preview image. When hovering with the mouse over a port, the parent system is shown in a preview image. When clicking on Help in the context menu of a block, a help view is opened, showing the MathWorks documentation website for that block type. Once open, the help view changes its content automatically when the user selects a block. Upon a double-click on an inport or outport, the parent system is opened. This is the same behavior as if double-clicking on the background. Fixed sporadic bug in the search window. Fixed propagation of selection to outline view when using the breadcrumbs view. Fixed a bug that prohibited the resolution of a referenced block in cases where this block was also referenced in the target library model. The signal tracing analyzes the signal flow from the selected signal line to the source or sink block. The tracing goes beyond hierarchical subsystem borders, mux/demux blocks and bus creator/selector blocks. Bus outputs are currently not supported. The visualization supports tracking of a trace if subsystems of a top-level system are displayed in other editor tabs. Signal tracing can be activated and deactivated via a signal’s context menu. Search selection highlighting was not removed on new selection in outline view. The [Enter] key on the number pad was not working in zoom text field and search text field. Elements open directly with one click. Zoom on keystroke changes zoom factor by 25 percent instead of 5 precent. Ensure initial viewport position is not above blank space when opening a model. 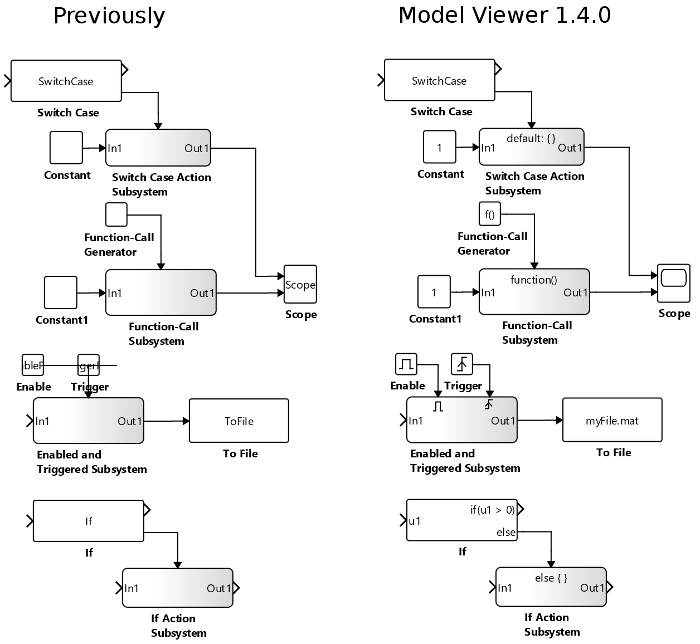 Fixed opening referenced Stateflow diagrams. Fixed incorrect routing of Stateflow transitions for SLX files. Display threshold value for switch blocks. Fixed rendering of history states. Displays search results in a tree view. Elements are sorted by their path. Path elements can be expanded upwards or downwards. Path elements that are not part of the search results are displayed in grey. Search results are truncated to one line. Only the line containing the search pattern is displayed. If an element is selected in the result list, it is surrounded by a red frame now. The search starts with the system currently displayed in the editor and is restricted to submodels. Reduced the search time and improved the response time of the search window. Text labels of elements, e.g., at transitions, can be selected and copied in the properties view now. Display block-specific visualization for referenced simple blocks. Handle linked folders when resolving reference from within a project. Added path column to search result to allow for sorting results by location. Fixed searching in multi-line texts. Allow for zooming in model via keyboard keys [Ctrl + +] and [Ctrl + -].